Features For Your Convenience on the Ford Flex | Dean Arbour Ford of West Branch Inc. The Ford Flex is a stylish SUV that has plenty of room for family and friends to ride in comfort. The Ford Flex offers you many features that keep you safe while driving. 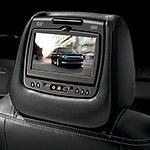 You will also find many convenience features available on the Ford Flex. The designers at Ford know that people who buy an SUV want plenty of cargo space. The Flex has plenty of space. When the third row of seats are down, there is 43.2 cubic feet of space. With the second row down as well, available space expands to 83.2 cubic feet. The Ford Flex also offers you the convenience of 10 cup holders throughout the vehicle. All of your passengers will have a convenient place in which to hold their favorite beverages. If you come to Dean Arbour Ford, you can take the Ford Flex for a test drive and find out if it is the vehicle for you.